← Riverbend Bound Once Again! So bye bye Riverbend! It was New Year’s Day, our renters would be arriving that afternoon so it was time for us to be back on the road again. It would be about a three hour drive to our next destination – a four night stay at Colt Creek State Park in Lakeland, FL, a park we had never visited before. With 5000 acres, the park itself is pretty large but the campground is relatively small with only 30 sites (24 RV or tent, 6 tent only). As soon as we checked in and made our way to our site, we were pretty impressed. Definitely big rig friendly with long, spacious sites and ample distance between each one. Not a lot of shrubs between them to provide privacy but we were lucky, on one side we had a wide gully which happened to be filled with water due to recent rains (fortunately due to cooler temps, no skeeters were buzzing around) while on the other side we had a wide expanse of greenery filled with natural growth. If you go, be aware that the Verizon signal here is very weak, making it difficult to even make a phone call! Not too much exciting to report during our stay except that we drove to Dade City to have breakfast at the Black Eyed Pea restaurant but when we got there, we weren’t impressed with the appearance of the place plus they had stopped serving breakfast and their lunch menu didn’t appeal. Instead thanks to Google we found The Green Door on 8th, which turned out to be a gem of a restaurant. Nice ambiance, interesting menu, reasonable prices and really good food. I had their Mac N Cheese ($9.00) while Rob had Shepherd’s Pie ($9.00) made with sausage, ground beef, corn, mashed potatoes and gravy. Both were served with a side salad. Excellent food! And I guess we thought we were still hungry (HA!) 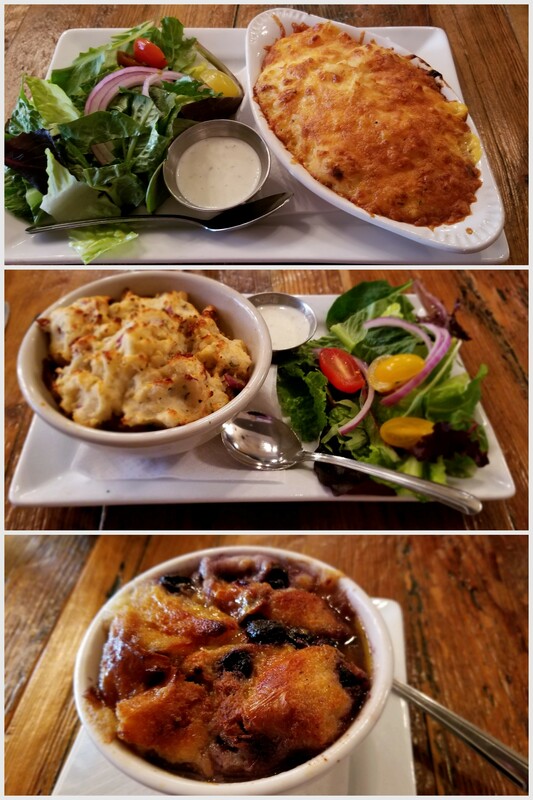 because we indulged in one of my favorites – Blueberry Bread Pudding ($5.00)! Oh, my, how totally delicious and decadent! Once we returned to the campground, to work off some of those calories, we went for a long walk on one of the 15 miles of multi-use trails. Not only was it a perfect day for a walk, we even found a geocache! After our relatively quiet stay there, it was a short 50 minute drive to our next destination, Lake Louisa State Park in Clermont, a park we had been to many times before. We’ve always liked staying here but this time we weren’t real happy with our site. Site #9 was right next to the road into the campground so there was quite a bit of traffic and since there was no vegetation bordering the road or our campsite, there was absolutely no privacy. Unfortunately, we had booked the same site for a return 3 night stay beginning on the 12th. Oh well, not a big deal! The morning after our arrival at Lake Louisa (which happened to be a Sunday), we decided to go out to breakfast at The Friar Tuck, which claims to have “the best English food this side of the pond…period!” Interesting menu! They serve breakfast all day long everyday except Sundays of course! Breakfast ends early so they can serve their weekly Sunday roast starting at 1:00 p.m. (protien varies weekly and it’s served until they run out). On this particular Sunday, “The Grand S’Lamb” which was Roast Leg of Lamb served with Yorkies, Mash, Roasties, Stuffing, Brussels, Garden Pea’s, Sweet Corn, Gravy and Stewed Apples would be served. Yum! The following Sunday the roast would be “Sir Loin of Beef” or slow roast of beef, most likely served with the same fixings. Never did find out the cost of the Sunday roast dinners. Unfortunately we were too late for breakfast but too early for the roast and their regular full menu wasn’t offered. The only choice we had was a Steak & Mushroom Pie ($13.00) which was what we both ordered, a Chicken Curry Pie ($13.00), or a Chicken Pot Pie ($13.00). Very tasty and highly recommended! Imagine my surprise when I made a trip to the Loo (aka Ladies Room) and was confronted with a huge picture of Queen Elizabeth staring at me from the back of the door. Even more comical was the “Ode to the Commode” and the “Toilet Ode – The Royal Supplement Verse” hanging on the wall. It made for a pretty amusing bathroom break to say the least! With this lifestyle, we are able to travel across this country and cruise its waterways, enjoying magnificent scenery, learning about the local history and meeting amazing and interesting people from all walks of life. Most of the time, it is a lot of fun but how quickly that can change when a medical or dental issue suddenly arises. Being hundreds of miles away from the doctors and dentists that we know is sometimes challenging. A minor medical issue can usually be quickly resolved because there are always urgent care facilities, walk in/minute clinics or in the worst case scenario an emergency room in a nearby town. But having a dental problem is much tougher. Urgent dental clinics, walk in dental offices…we’ve never seen one anywhere, have you? And of course, phone books with yellow pages to consult (shades of yesteryear – remember those?) are non-existent. So what to do? Consult Google, of course! Heavens, what did we do before we had smart phones and this tool became available? Finding a listing for a local dentist or specialist usually isn’t too difficult but besides that, if you have insurance you need to find out what insurance companies they honor. That can be done by checking out their website (if they have one) or by calling them. Then before actually calling for an appointment, you must check out any reviews which hopefully are legit and honest. Perhaps after doing all that, you’ll end up with a reputable medical professional. So why did I get on that soapbox? I don’t believe I ever mentioned that prior to our arrival at Topsail, Rob had a tooth that had been bothering him, not really painful but uncomfortable. So before we left Topsail, he followed all the steps above, researching endodontists in the area and was able to schedule an appointment for the dreaded root canal with an excellent and very reputable endodontist, Dr. Heath Deason in Fort Walton Beach. Everything went great with that procedure – no pain afterwards! Yippee, no more teeth issues! Whoa, wait a minute, not so fast! During our stay at Colt Creek, suddenly he started to have pain in another tooth. Say what??? That’s not fair! Since this couldn’t wait, he immediately started searching for a dentist who advertised emergency service so he could at least have the problem evaluated. Word of advice, don’t ever need a dentist on a Friday! It seems that the majority of them, at least in the Lakeland area, are either totally closed on Fridays or are only open until noon. Since none of them were open on the weekends, our assumption is that they only work a 4 day week. How sweet is that, for them anyway, not so great for patients! Not sure how many offices we called, probably at least 12, without any luck. Even those who were open and offered emergency service couldn’t squeeze him in that day (hmmm makes you wonder if they know what the word emergency means). But finally, good news – the very nice staff at Lake Gibson Dental had an appointment available if we could get there right away. Not a problem, we were there in 15 minutes! Long story short, that dentist thought that the pain might be caused because he needed an adjustment of his bite. While reshaping the tooth that was bothering him, he explained that if the pain wasn’t gone by the next day, Saturday, then Rob most likely would need a root canal. Despite keeping our fingers and our toes crossed in the hopes that the pain would go away, the next day it hurt even worse. Bummer! And since it was a Saturday he would have to suffer with it all weekend which gave us plenty of time to contemplate the logistical nightmare we would face on Monday, the day we had to check out of Lake Louisa. Would he be able to get an appointment first thing in the morning? Check out time at Lake Louisa SP was 1:00 p.m. Would he be able to get an appointment early enough in the morning to allow us to check out on time? If not, once we left the campground, where would we park the coach? And if he couldn’t get an appointment on Monday, would he be able to get an appointment at our next destination? And how would he deal with the pain in the meantime? Fortunately everything fell into place! First thing Monday morning he called Advanced Endodontics in Clermont which was only a few miles away. Woo hoo! They had an appointment available at 11:00 a.m. And there was a Walmart across the street so we could park the coach in the parking lot, then go to the appointment. The initial diagnosis was that he had a fracture in his tooth but they wouldn’t know how deep the fracture was until they started to work on it. 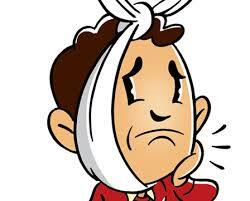 The bad news was that if it was a significant deep fracture, they wouldn’t be able to do a root canal instead he would have to see an oral surgeon to have it yanked. But fortunately there was good news! It wasn’t that deep of a fracture so they were able to proceed. Another successful procedure! He had a little discomfort after the fact but certainly better than how it felt before. Although he will now need to get a crown, hopefully no more root canals will be on the horizon! Lesson learned – forget the dentist and go straight to an Endodontist. The main takeaway from both root canal experiences is if you think you need a root canal, skip the ordinary dentist (DDS) and go straight to the expert, an Endodontist (DMD). DDS practitioners may occasionally do root canals but that is all an Endodontist does so they are quite expert at it, tend to have all the latest equipment, can get you in and out quickly and the cost is about the same. A few DDS’s Rob talked to weren’t offering a one day procedure for example, whereas almost any Endodontist can. Most have digital x-ray and other special equipment that can get you in and out within about an hour. The process is no worse than an ordinary filling, administration of the local anesthetic is the worst part and takes up about a third of the visit time. You will need to visit a dentist however for a followup crown if needed. With that done and Rob still throbbing from the Novocaine, we were off to a place near and dear to our hearts! Can you guess where? Hope you start to feel back to normal Rob. Sue had an emergency root canal in Tennessee, and we had a similar story and outcome to yours. You forgot to tell your readers about the $2000 bucks you probably blew thru. We are the full time couple that are pulling the 2013 Honda Odyssey, so far so good. You can follow our travels at our new Youtube channel , Our Journey In Myles-Youtube Yes, our rig is named “Myles”! Hey Mark, of course we remember you. Hope Sue is doing well. Our Ody is still going strong with the “used” transmission. My first root canal was about $800 something after insurance (they didn’t take my insurance so didn’t match the allowed amount). My second root canal was $600 something as they did accept my insurance. Still need to get a crown tho on the second one and I’m sure that will be big bucks. We’ll check out your YouTube channel, thanks! Love the name!! !